Toyset Children’s ride for hire. The Toyset is a Merry-go-Round style ride which features different types of fun vehicles or toys on which the children ride. The Toyset is suitable for both boys and girls between the ages of approximately 3 - 10 years. It is ideal for children’s parties and private functions or for family fun days and fairs. 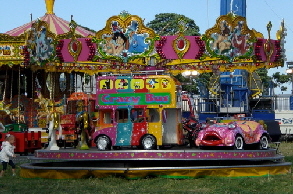 The Toyset ride is available to hire for public events, private functions and film/photo shoots. If you would like to hire the Toyset ride, contact our helpful team today for a no obligation quote and to find out more. Our attractions are fully staffed, are insured for public liability and carry full safety certification.